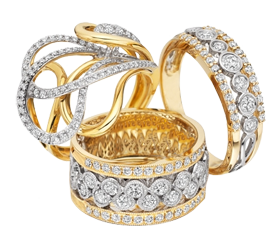 We have state of art process & jewelry manufacturing unit in SurSEZ in India. This unit have capacity to manufacture over 1 lac pieces per year. Factory has a particular area of specialisation, allowing us to achieve and maintain expertise for many different product segments at the same time. For factory, we select equipment, recruit and train our workers and appoint management based on the specific needs of a particular segment. One factor remains constant: quality. Whether we’re manufacturing a high volume order on fast turnaround for a major chain retailer or producing a one‐off complex piece for a private customer, quality is key.